Wondering what the next big buzzword for smartphones is? Sure, at the moment every manufacturer left and right is busy touting some kind of AI for its latest devices, but the future is blockchain. The future of buzzwords in the mobile world, that is. We've already seen a couple of early adopters: the Sugar S11 Blockchain Creation Edition in January, and the Sirin Finney earlier this month. Today it was time for the first well known smartphone brand to jump into the fray: HTC. 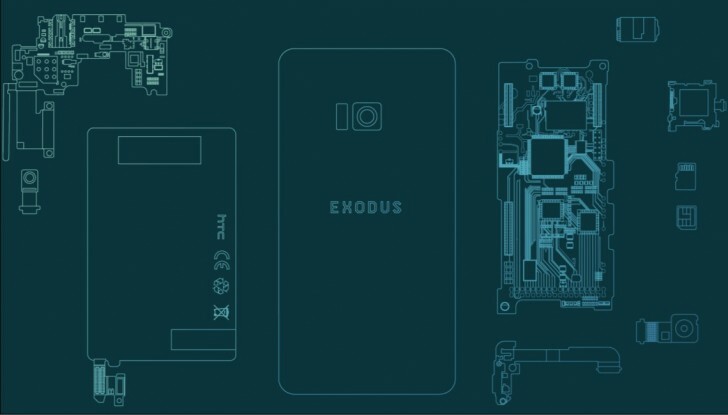 The Taiwanese company has announced that it's working on a handset called Exodus, which will be its first blockchain smartphone. No official photos have been made public yet, just the product drawings you can see above. The Exodus will feature a universal wallet and a built-in secure hardware enclave to support cryptocurrencies and decentralized applications. HTC plans to create a native blockchain network with all Exodus units acting as nodes to facilitate cryptocurrency trading among their owners. Additionally, the company is considering accepting cryptocurrency payments for the phone itself, even though its price is yet to be decided. Through Exodus, we are excited to be supporting underlying protocols such as Bitcoin, Lightning Networks, Ethereum, Dfinity, and more. We would like to support the entire blockchain ecosystem, and in the next few months we’ll be announcing many more exciting partnerships together. The unique selling point of a blockchain smartphone is that it supposedly offers better security and an improved user experience by integrating cold wallet storage right into the device, and enabling direct trading of the native cryptocurrency with peers without mining fees. Supporting cryptocurrency doesn't make one a 'blockchain smartphone'. Unless phone's OS is some sort of shared ledger, its not a blockchain phone.